If 2010 was the year of social media coming of age, my notion for 2011 is “the year of acceleration”. Certain developments took place in year 2010 proved that social media is not a fad, and it is here to stay. Now it is time for accelerating the trend. However, even throughout the year 2010, I heard some traditional marketers still arguing social media as a fad. Among them were few high profile managers in the telecom industry and few brand managers from multinational FMCG companies. Either they seem not fully convinced about the power of social media as a marketing communications tool, or they may be excessively overwhelmed by the current success they earn with traditional marketing channels. If their predictions to hold true, we have to expect a social media bubble burst in the year 2011, as the dot com bubble burst we experienced in year 2000. 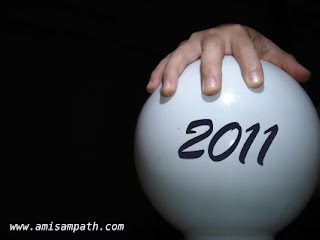 Here are my six predictions for the year 2011. I first wrote about Social Commerce in a post, dated 5th March 2010, and predicted ‘Social Commerce’ as the next big thing to watch. In this post, I defined Social Commerce as “use of social interactions on the internet, to create commercially viable product ideas and facilitating the exchange process of such products”. Later I followed up this post with another post dated 13th March 2010, and discussed about some emerging successful social commerce business models. For the year 2011 as well, I strongly predict Social Commerce as the biggest trend, waiting to happen. With the popularity of group buying sites, the use of social media in eCommerce will reach new heights. We can expect the concept of Groupon reaching more local markets, and innovations will be introduced. For many Americans Julian Assange may be a villain, but he and his Wikileaks.org opened the spectrum of social media into a much-unexpected direction during the later part of 2010. Some might argue wikileaks was a positive development while some might still argue the opposite. The Cablegate saga captured the attention of mainstream media across many countries, and political analysts around the world started arguing the positive and negative consequences of similar “social whistle blowing sites”. I’m sure, this has alarmed many governments across the world, not only the governments in South Asia and Latin America, but also the governments in the so called developed world in Europe and North America. As a result, we can expect governments around the world introducing new legislations to control the information being shared on social media web. These new legislations might involve breach of user privacy, and control over what you may and may not share on internet. For many years, Human Resource managers hated social media and dubbed it as a major productivity killer. They embraced blocking social media sites as a corporate policy, and disregarded social media as anything of value. However, I expect to see a significant difference in this perception among HR professionals during the year 2011. They have already recognized social media as a great recruitment tool. Social Networks like LinkedIn are good online and real-time resumes of people employable at your organization. Facebook can be a fast and inexpensive channel to broadcast your job vacancies to a relevant audience of a connected network of professionals (for example, engineers). Beyond recruitment, social media can be used for employee motivation by introducing a more socially oriented interface for company intranet environments. Eliminating the boring structural nature of first generation company intranet systems and introducing more fun and modern looking interfaces can help establish employee relationships stronger, and keep the ‘happiness level’ high. Of course, it is still arguable how to handle the ‘productivity’ element, but I’m sure the profession of HR will come up with a constructive way for meet that criteria as well. Smartphone penetration around the world will rise; making location based social media tools such as Foursquare and Facebook Places more widespread. Marketers will see mobile social networking as a more lucrative channel to be in touch with customers and invest more on m-commerce applications. So far we have seen a huge contradiction in the way how traditional media enthusiasts (traditional marketers and media organizations) and new media enthusiasts described social media. New media fans always predicted social media as a “traditional media killer” while conservative marketers and media gurus dubbed social media as a ‘fad’. However, I predict progressive signs of these two channels converging into co-existence, as we move along. Traditional media will remain the mainstream channel of customer communication for brands for a foreseeable future, while social and other digital channels penetrating slowly into their territory. In any company’s brand communications mix, traditional media will remain as the main channel of communicating a ‘comprehensive story to a wider range of customers’ while social media will emerge as the channel of reaching ‘highly targeted audiences and keeping them engaged’. The year 2011 will be the death of Web 1.0 as we known it. From 2011 and beyond, there will be no comparison between web 1.0 and web 2.0 and everything on the web will work with the new rules of the game. All the world’s large news corporations will liberalize their policies on user comments. Ecommerce websites, particularly in the travel and hospitality sector will realize non-moderated user commnets/reviews can actually help boosting the 'trust' element among the customers, which will outset the disadvantage of occasional negative comments.